Sage is a familiar taste all around the world, but many remain unfamiliar with this herb's medicinal history and range of modern applications. A favorite among chefs and herb enthusiasts, common sage has been a staple herb for centuries in many parts of the world. This perennial shrub is valued for its flavor along with its nutritional and medicinal purposes. It is often associated with hearty holiday meals, such as Thanksgiving in the United States. It is also a popular herb to grow in the garden or as a houseplant for reaping its benefits all year long. Thanks to Italian, Balkan, and Middle Eastern cuisines, sage remains a popular ingredient to this day. Improving digestion. Sage and sage tea have historically been used to improve digestion and soothe instances of indigestion and diarrhea. Improving memory and cognition. Additionally, scientific studies have discovered that sage can help with age-related memory loss and general brain functions, and it has been suggested that it may also reduce the effects of Alzheimer's. Additionally, sage has been shown to be effective reducing night sweats and hot flashes, among other menopause symptoms. Sage owes its medicinal properties its high concentration of flavonoids and phenolic compounds, which possess strong antioxidant effects. Sage flavonoids aid digestion by facilitating the decomposition of food that enters the system and preventing microbial growth. 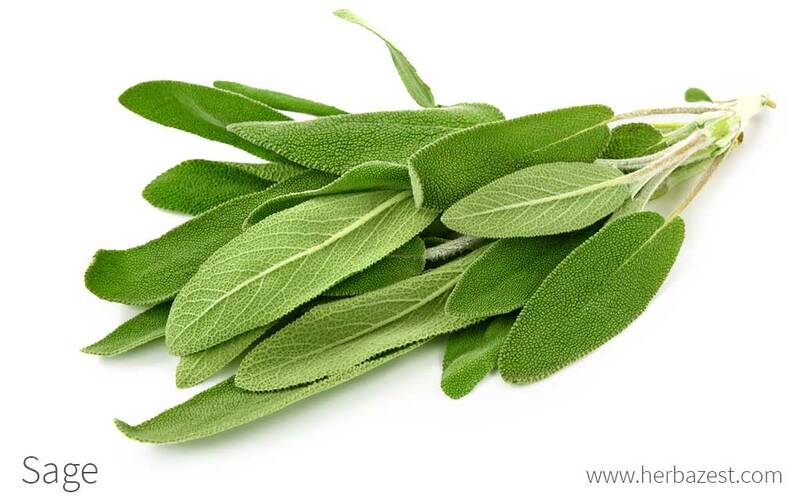 On the other hand, sage has been shown effective in the treatment of hot flashes, a common menopause symptom. It is thought that the active compounds of the herb are able to regulate the neurotransmitters affected by estrogen deprivation. Additionally, carnosol, carnosic and rosmarinic acids, and rosmadial, the main phenolic compounds of sage, work together to stimulate the antioxidant defense systems, which help improve cognitive performance. When taken as a tincture, sage releases acetylcholinesterase (AChE), an enzyme that inhibits the chemical messenger acetylcholine. By maintaining acetylcholinesterase levels in the brain, sage can lessen the degeneration of mental capacities and may potentially delay the onset of Alzheimer's disease. Digestive properties are also present in cardamom, cinnamon, and oregano, whereas saffron and ginkgo help prevent cognitive decline. Sage is considered safe in culinary amounts. While more research needs to be conducted in order to determine the potential side effects of sage in medicinal preparations, it is likely safe for those who do not take it orally or use it topically in the long term. However, sage contains thujone, which in large doses can lead to seizures, as well as damage to the liver and nervous system. Sage is likely safe when applied topically. However, skin irritation can occur in sensitive people. Because common sage can potentially lower blood pressure levels, it is recommended that those with hypotension or taking blood pressure medicine limit their intake of the herb. Those who regularly suffer from seizures should also exercise caution when consuming sage due to its thujone content, which can worsen this condition. Because of its thujone levels, women who are pregnant or breastfeeding should practice caution when consuming sage. Thujone can trigger a menstrual cycle, which can lead to a miscarriage in some instances. For mothers who are breastfeeding, thujone can reduce the milk supply. The most effective way of obtaining the health benefits from sage is in medicinal forms of consumption, where the properties are more concentrated. Raw. While sage is rarely consumed raw, it is occasionally used as a garnish for many dishes. While more research needs to be conducted to better understand why, consuming raw sage can help improve memory and other mental functions. Freshly ground. A popular spice in the kitchen, sage is used to flavor many different dishes. It adds a savory, peppery dimension to dishes, so it is typically added near the end of the cooking process. Freshly ground sage eases many stomach ailments, including diarrhea or upset stomach. Infusion. Preparing a warm infusion using fresh or dried sage leaves can provide a number of medicinal benefits. Sage tea offers high levels of antioxidants, which slow down the aging process by preventing memory loss and general cognitive decline. Tincture. When the leaves of sage are macerated in a neutral alcohol a concentrated preparation is obtained. By diluting few drops in a glass of water, sage tincture can help with cognitive functions and reduce perspiration, which can ease night sweats. These effects can last for several days. Essential oil. The essential oil obtained from sage leaves facilitates digestion and inhibits the microbial growth that interferes with a proper digestion. Capsules. When taken as a capsule, sage can improve cognitive functions, such as memory. This is due to its cholinergic properties. Fresh sage is a widely-available product that can be found in most grocery stores, either whole or pre-chopped. herbal stores and farmers' markets are more likely to carry whole leaves, while garden centers are great places to find a sage plant to cultivate at home for a renewable supply. The dried leaves of sage can be purchased from specialized health stores or online retailers, in bulk form or as teabags. Sage supplements can usually be found where other herbal supplements are sold, such as supermarkets, pharmacies, and local health stores. However, it is recommended to consult your doctor before deciding to take sage in medicinal doses. Sage is frequently packaged along with other spices that are deemed essential to everyday cooking. Popular in many herbal gardens, sage is a perennial evergreen that yields the best results when planted during early spring, when temperatures range from roughly 60 - 70°F (15 - 21°C). Full sunlight and soil that drains well will create ideal conditions, though once fully established, the herb can withstand slightly harsher surroundings. Late frosts can easily wipe out herbal seedlings, so it is recommended to transplant them once they've reached 18 - 24 inches (45 - 60 cm) in height. Detailed information about growing sage can be found in the herb garden section. Standing an average of two feet (60 cm) tall, sage is a perennial shrub typical of temperate climates and Mediterranean landscapes. From plant to plant, this shrub can vary in size, flower color, foliage pattern, and leaf type, but leaves tend to be square and grey-green while flowers are purple or blue. Sage (Salvia officinalis) is a member of the Lamiaceae, or the mint family, along with over 7,200 species, including skullcap (Scutellaria lateriflora), rosemary (Rosmarinus officinalis), basil (Ocimun basilicum), lemon balm (Melissa officinalis), peppermint (Mentha piperita), and thyme (Thymus vulgaris). S. bowleyana (nan dan shen) and S. miltiorrbiza (dan shen) are both native to China. S. coccinea (blood sage) grows across the Americas. The seeds of S. columbariae or California sage (from western North America) and S. hispanica or chia, from Central America, are both used in the same way. S. divinorum (salvia) only grows in Mexico and it is ritually used for its psycoactive properties. S. viridis, also known as painted sage, is common in the Mediterranean basin. S. lavandulaefolia (Spanish sage) is native to France and Spain, it lacks thujone (the toxic compund in S. officinalis) and it is also used to enhance cognitive function. S. pomifera (Cretan sage) is restricted to Greece and parts of the Mediterranean. S. sclarea (clary sage) and S. repens (creeping sage) are native from southeastern Africa. Ancient Greeks are responsible for the first records of the use of sage, which is native to temperate Mediterranean climates. Original uses included the treatment of snakebites and increasing female fertility. Historians report the use of sage during the Roman Empire as a diuretic and anesthetic, but the plant continued on to greater fame in the Middle Ages, when it was incorporated into mixtures that were meant to prevent the plague, and its healing properties were widely renowned. Many industries employ sage, its distilled essential oils, and other sage-derived products. Dried sage leaves can be found in the spice racks of many families' cupboards in the Western world, leading to an avid import business. Albania and Croatia are the traditional top suppliers of dried sage, and its annual trade is valued in approximately $5 million USD. Furthermore, the distilled essential oil is used extensively for manufacturing perfumes, soaps, and cosmetics. The sage plant by itself and its seeds are a staple of gardening, and thus are frequently commercialized as well. For many Native American tribes, sage is considered a sacred herb because of its purifying energies and played a role in past and present ceremonies. Along with a mix of other herbs and berries, it was used in a Kinnikinic mixture. This mixture was smoked in a sacred pipe and offered to the Spirits. Gardening. Those who like to garden may choose the herb for aesthetic pleasure, as the right conditions can let it grow large enough for a pretty ground cover of purple flowers. Aromatherapy. Sage's aroma is considered soothing by many people, and it is traditionally associated with health, happiness, and good tidings. For this reason, the herb is incorporated into soaps, perfumes, and other beauty products.